The Nashville Predators continued their preseason hot streak alive when they defeated the Winnipeg Jets 3-2 in a shootout at the MTS Centre in Winnipeg on Friday night. The Preds are now 6-1 during the exhibition season. It was Cal O'Reilly's night as he scored the first goal of the game and then scored the only goal and game winner in the shootout. After a successful preseason camp with the Nashville Predators, he agreed to sign a three year entry level contract worth $1.685 million. Currently, Valentine is in camp at the Preds' AHL affiliate, the Milwaukee Admirals. We would like to thank our friends from Illegal Curve who provided a preview of tonight's game between Winnipeg and Nashville as well as a copy of the rosters. They also have a roundup of articles about the Jets this AM. Game Time is 7:30 p.m. CDT. There is no local TV or radio but TSN-Jets will have the game on in Canada so an Internet feed is likely. You can also listen to the Jets Radio feed at Sports Radio 1290 from Winnipeg. The Nashville Predators are in Winnipeg to play the Jets tonight at 7:30 p.m. CDT. There is no official TV or radio but the game is being broadcast over TSN-Jets so those inclined to look may be able to find a feed somewhere on the Internet. It is a homecoming for several Preds who have never played in their hometown area including Barry Trotz and Colin Wilson. Wilson was excited to be going home after Wednesday's game, "I'm looking forward to going back up there. I've got some dinner plans with my parents so that will be fun." From Winnipeg, we hear that Dustin Byfuglien will not play for the Jets tonight. Here is a list of who the Jets will put on the ice. Don't forget about all the weekend's fan appreciation activities and tomorrow's open house before the Predators-Hurricanes game tomorrow night. The last major hold out of the NHL preseason has finally come to terms on a new contract. Drew Doughty finally has a new deal. According to the Kings it is an eight-year deal with multiple sources putting the value at $56 million. Rich Hammond has comments from Kings' Governor Tim Leiweke. After reading John Manasso's piece today on realignment, it sounds like a compromise agreement may not be as difficult as it once seemed if the primary goals are to keep opposite coast trips to a minimum and have a more balanced schedule. It looks like the Predators would like to stay in the Western Conference as long as Detroit does too. Detroit appears willing to stay in the West if they could only head to California once a year. Under those parameters, Columbus would be the best choice to go East. It's still the preseason but it feels like we are in the middle of it already. Fans are starting to get excited as the Predators are 5-1 after beating a respectable line-up from Washing ton last night. After the game, Barry Trotz said, "Winning breeds winning" which is what you would expect at this point. It's much better than if the Preds were 1-5 and folks were acting like the bottom had fallen out. Here is our comparison of Colin Wilson and Craig Smith as well as our morning after round-up for all the links and stories from last night's 4-1 Predator victory that was a solid effort from start to finish. Here is our game story from last night where we look at Colin Wilson's and Craig Smith's roles in the Preds win. Barry Trotz's post game video is here. Also, goalie Jeremy Smith was sent to Milwaukee after the game. Heralded rookie, Craig Smith is doing everything that he can do to make this year's Nashville Predator roster. In contrast, Colin Wilson who is 45 days younger, is headed into his third year with the Preds and seeking to gain consistency that has eluded him at times in his 117 game NHL career. Both players were instrumental in the Predators 4-1 preseason win over the Washington Capitals on Wednesday night at the Bridgestone Arena that pushed the team's record to 5-1 in the exhibition season. Wilson showed brilliance at both end of the ice in scoring the Predators first goal to tie the game 1-1, 13:52 into the opening period. On defense, he salvaged a weak break out pass from Kevin Klein at one end of the ice and then trailed David Legwand the length of the ice to put the puck in the Caps net for the tying goal. The Nashville Predators reduced their roster to 31 players tonight by sending third goaltender Jeremy Smith back to the Milwaukee Admirals preseason camp. The third annual Preds Fest will run all weekend starting Friday as a celebration of fan appreciation by the Nashville Predators. Sandwiched around Saturday's game against the Carolina Hurricanes, with the pregame plaza party, are activities on Friday and Sunday. On Friday there are open skates on the Bridgestone ice and on Sunday there will be 12 high school hockey games and much more. One of Canada's more unique hockey personalities will be coming to Nashville on a weekly basis on 102.5 The Game on Sunday nights at 7 p.m. starting in October. Launy 'The" Schwartz will bring his brand of hockey talk and reporting to the local airwaves as the NHL season gets underway. Launy, along with his producer, Dahlia Kurtz, have traveled to many NHL events including the Awards Show, All Star Game, and Heritage Classic to bring their fans information that you don't see elsewhere. Most recently, Schwartz has traveled across Canada as the spokesman for Booster Juice at many events as a correspondent and in-game talent. You can visit his home base at Hockey 54 for some classic videos with the NHL's top stars. The rosters for tonight's Preds-Caps game set for 7 p.m. at the Bridgestone Arena have been released. Go here for a printable copy. The tight battle for the last defensive positions are reflected with Jack Hillen, Teemu Laakso, and Mattias Ekholm in the lineup. Craig Smith and Gabriel Bourque are also slated to play to sport their offensive talents as they battle for a slot. Washington's lineup features ex-Preds Joel Ward and Tomas Vokoun. Most of the Caps regulars are in the line-up except for Alex Ovechkin. The Nashville Predators will take on the Washington Capitals tonight at 7 p.m. at the Bridgestone Arena. It will be interesting to see if Joel Ward and Tomas Vokoun make the travel roster and return to their old haunt against the team where they developed into well known players. For the Preds, the battles for the last defensive and offensive slots among the players remaining in camp will continue. Expect to see Pekka Rinne start the game and go the full 60 minutes after a premature end to the evening on Saturday when he received a cut to the brow in an unexpected way. On defense, my guess is that Jack Hillen and Teemu Laakso are the third pairing waiting for someone to unseat them. On paper, it would seam that Tyler Sloan would have an inside track over the rookies for the seventh slot. Will someone else prove that they are worthy of an opening night roster slot in tonight's game? On the offensive side, there are still battles ongoing and a lot will depend on whether Blake Goeffrion will be able to return an play in the preseason. You have to think that a spot is Chris Mueller's to lose after a great preseason. Come out to tonight's game and watch the Preds take on the preseason favorite for the President's Trophy and all the Preds' youngsters fighting for a spot on the final roster. This week we were pleased to have the legendary Mike "Doc" Emrick on the latest edition of RLD Hockey Talk to discuss a wide variety of topics. We covered a lot of ground discussing his new deal with NBC Sports as well as looking back at his best memories during his many years with the Devils. With the Winter Classic announcement on Monday, we discussed what he expected out of this years production and he gave his reflections on the first four New Year's Day classics. He also discussed his favorite series from the Stanley Cup Finals. The show concluded with Ryan Porth's and Buddy Oakes' early predictions on both the Eastern and Western Conferences as well as a Stanley Cup Finals winner. This is much needed analysis before you head to Vegas to place your preseason wagers. Today is one of the last chances for the public to see the Predators practice in the preseason at Centennial Sportsplex as the action will be shifting more and more to the Bridgestone Arena and on to the road. Bryan Mullen has the update from camp. On ice sessions are scheduled today from 11:30 until 2:30. Earlier today, we had a story about Pekka Rinne looking to improve on last year's Vezina nominated season. Pekka Rinne returns for his fourth year as the Nashville Predators' primary netminder and should be entering the peak of his career with a perfect mix of age and experience at 28 years old. He has shown steady improvement over the last three years that culminated in his Vezina nomination and trip to the NHL Awards in Las Vegas in June. Had it not been for a record setting season for Boston's Tim Thomas, Rinne would have been a shoe-in for the award as he finished second in the voting, finishing close to Thomas and well ahead of Roberto Luongo who was a distant third. Rinne's 64 appearances, 33 wins, 2.12 goals against average and .930 save percentage were career highs in all categories. In spite of all the attention, the mild-mannered Finn remains humble as always and has his sights set on improvement. "That was a confidence boost for sure. At the same time, I want to be a better goalie. There’s always room to improve for myself." The Nashville Predators assigned Ryan Thang to Milwaukee today bring the roster down to 32 players. With injuries to Francis Bouillon, Blake Geoffrion, and Roman Josi, there are 29 players healthy and available for practice and games. If these three players start the season on injured reserve, the Preds would need to pare down a goalie, two defensemen, and three forwards if they carry the maximum roster of 23 players on opening day. In a surprise announcement today, NHL Commissioner Gary Bettman announced that the 2012 NHL Winter Classic would be held at Citizens Bank Park in Philadelphia on January 2, 2012 and match the hometown Flyers against the New York Rangers. Bettman explained, "The Rangers-Flyers rivalry is one of our very best. It is only a short distance from Broadway to Broad Street, and over the years, these not-so-neighborly teams have provided an assortment of memorable games. I have every expectation that the 2012 Bridgestone NHL Winter Classic will provide more great moments to remember." It will be the fifth Winter Classic and the first to not be on New Years Day. The ballpark seats 43,500 for baseball and will be configured with the temporary rink in the middle of the field. This will be the third baseball field used for the outdoor event. HBO will produce another four part 24/7 series that will air on Wednesday nights starting on December 14 and conclude on January 4. Here is a copy of the complete transcript from the announcement. If you look at the Nashville Predators roster as it stands today. the 33 names on the list are what Barry Trotz would consider the "core" of this year's team. Last year, the Preds played 35 different players over the course of the season. Regardless of who makes the final cuts and appears on the opening day roster, these 33 players all stand a good chance of hitting the ice in Bridgestone Arena at some point during the season as replacements will be needed as injuries and other circumstances arise. The next week will be interesting as the Preds play three more exhibition games and pare down to the final roster. Earlier today, we has a post about the reflections of the three new Preds playing their first game in Smashville. On Saturday night, when the Predators came from behind to beat Winnipeg 4-3 in the first meeting ever by teams from the two cities, three Predator players took to the ice wearing the "Predator Gold" for the first time on home ice as a Nashville Predator. All three came from different backgrounds but described their first game in front of the home crowd as "great," "incredible" and "awesome." In comparison to the crowds down the stretch and in the playoffs last season, the preseason crowd of 14,701 was actually rather timid. There were no TV time out standing ovations or other patented Bridgestone antics that the crowds are known for. It wasn't too many years ago when the morning after a Nashville Predators game that you would have to hunt in the Nashville Tennessean to find out what happened the night before. That is no longer the case. Thanks to Kevin Wilson, the Predators' Manager of Hockey Communication, with the support of the Pred's management and ownership groups, there has never been more coverage of the team than there is this year. Being a "non traditional market" where the main stream media has a long history of being focused on football 24/7/365, the Predators looked for new ways to reach fans. Last season, they reached out to the Internet media with the official establishment of "Blogger's Row." Their efforts have blossomed this season with a large stable of writers covering games and practices to produce a quantity and quality of stories that are unprecedented in franchise history. Newcomer Zack Stortini showed incredible restraint when he was horse-collared and thrown to the ice by Troy Bodie with 8:29 left in the second period of the Predators 4-3 preseason win over the Winnipeg Jets at Bridgestone Arena on Saturday night. At the time of the play, Nashville was down 3-2 and needing a boost to try to overtake the Jets who had led the entire game. On the play, Bodie was accessed a double minor, giving the Predators four minutes of power play opportunity. Stortini happily skated off the ice as he had done his job well. Stortini explained the play, "It's something that's not always easy, but it's important to have that mindset and be cognizant of whats going on out there on the ice. It was a situation where we needed a power play and I was fortunate enough to draw one." During the resulting man advantage, the Predators scored two goals, first one by Marty Erat at 12:30 and then another one by Patrick Hornqvist 80 seconds later, to take a 4-3 lead that was never relinquished. After Saturday's game against Winnipeg, The Nashville Predators cleared plenty of space in the locker room by sending 17 players to Milwaukee and back to their junior teams. That leaves 30 healthy players in camp as Mike Fisher, Francis Bouillon, and Blake Geoffrion are all sitting out with injuries at this time. Today is the day that all of Smashville has been impatiently waiting for since the Nashville Predators skated off the ice after bowing to the Vancouver Canucks in games six of their second round series last May. Being the shortest summer ever for Preds' fans was no consolation as the offseason was not a particularly smooth ride with Shea Weber going to arbitration, the issues with the RFA contracts in early July, and the lack of signing any big name players. All that will be in the past in the minds of the players as well as the fans when everyone shows up at the Bridgestone Arena tonight in their new Predator Gold jerseys that are on sale now. The Preds are coming off of a successful 3-1 road trip that includes a come from behind 3-2 win on Friday night against a much stronger Carolina team. Here are some pictures from the game courtesy of Jamie Kellner that are excellent. Tonight's line-ups for both teams and the updated NHL preseason stats can be found here or at the preseason link under the header above. Our friends at Illegal Curve have the morning links about the Jets and all else you need to know about the old Thrasher team. The Nashville Predators will take on the Winnipeg Jests tonight at 7 p.m. in their first home preseason contest of the year at the Bridgestone Arena. The Preds bring a 3-1 preseason record into the game which is the first of three games at the arena before the season kicks off. There are are a few tickets left for tonight's game and plenty of activities on the plaza before the puck drop. Go here for more details. If you are unable to attend, the game will be streamed on the Preds web site as well as Fox Sports Tennessee's site. Here Is the Predators Roster as well as the one for the Winnipeg Jets. With a few exceptions, the Predators have a team that is fairly representative of what you could see opening night. There remains an intense battle on defense as well as for the last few forward positions. The goaltending lineup is also in the process of sorting out to see would would be the first call-up from Milwaukee should Pekka Rinne or Anders Lindback suffer an injury. The Predators still have 52 players on the preseason roster and with Milwaukee's camp opening on Monday, there should be wholesale cuts within the next 24 hours. I would expect to see less than 30 or so healthy players remaining in camp by the first of the week. As a special bonus this morning, here is the complete NHL Stats package for all teams through last night's games. It's interesting that Chris Mueller and Colin Wilson are tied for the league lead in points. The Nashville Predators scored two third period goals to come from behind with a 3-2 win over the Carolina Hurricanes at the RBC Center in Raleigh on Friday night. Chris Mueller's backhander with 13 minutes left in the contest was the game winner. It came just 1:37 after Jack Hillen wrister tied the game 2-2. Anders Lindback got the win in relief, stopping 20 of 21 shots over the final 40 minutes of the game. Jeremy Smith started the game and stopped eight of nine in 20 minutes of play. Carolina got on the board first, 31 seconds into the game, when Alex Ponikarovsky made a wrap-around move that caught Smith by surprise in his first of two goals on the evening. David Legwand tied the game 1-1 late in the second period. The Predators headed back to Nashville after the game and are now 3-1 in preseason play. They will face the Winnipeg Jets on Saturday night at the Bridgestone arena at 7 p.m. in their first home contest of the year. The Nashville Predators and Fox Sports Tennessee announced that Saturday's and Wednesday's games will be available online. The Predators are headed into a big preseason weekend with games tonight at Carolina (which may or may not be available on radio or video from the Carolina website) and the season opening affair at Bridgestone tomorrow against Winnipeg that has many other activities surrounding the game itself. Jobs are on the line and the Predators still officially have 52 players in camp in spite of several players like Francis Bouillon, Mike Fisher, Brodie Dupont, Ben Ryan, and Roman Josi being injured to different extents. Here is the Predators' roster for tonight's game against Carolina. Pekka Rinne is not traveling and will probably start on Saturday. There's also a bunch of players battling for roster spots on the trip. Chip Alexander indicates that Cam Ward will finally get a start against the Preds tonight in Raleigh. Allegedly, there has been talk of a blackout but check with WRAL to see if you can listen outside of Carolina. The Predators will hold practices today at Bridgestone that will be closed to the public. Can Sergei Kostitsyn Improve on His Break Out Season? One of the real hidden gems of David Poile's dealings in the summer of 2010 was the acquisition of Sergei Kostitsyn from the Montreal Canadiens in exchange for the rights to Dan Ellis and Dustin Boyd, who Poile had no interest in signing. Kostitsyn had finished the prior season deep in the Canadiens' doghouse and the parting was a joyous occasion for both the team and the player. Kostitsyn was not considered a team player by the Habs so it seemed like an odd match for him to be going to the Predators, a franchise that focused on team play and one-ness like few others in the league. Poile signed Kostitsyn to a low risk $550,000, one way contract and he was given a chance to make the team. He played well enough in the preseason to stick with Nashville but started the season with a fracture in his foot and did not play his first game until October 14 against St. Louis. Kostitsyn was averaging just about ten minutes a game once he returned and did not get is first point until October 24, when he scored a goal against St. Louis. After that, his ice time deteriorated and through the end of November he only had two goals and an assist in 19 games. Barry Trotz was patient and saw enough things that he liked to keep him in the lineup. In December he finally took off. Trotz explained, "He had a tough buy in to the way we played but once he came around then you saw him blossom." This weeks episode of RLD Hockey Talk featured USA Today's Kevin Allen and NHL.com's Dave Lozo in our Eastern Conference preview. We break down all 15 teams from the East with thoughts and insights from Kevin and Dave as we move closer to the regular season. When you pick up the brand new 2011-12 Nashville Predators Media Guide and go to the roster of organizational players to do a little research on defenseman Scott Ford, you quickly find that he is not listed. Further research shows that he is signed to a one-way AHL contract with the Milwaukee Admirals, yet he was one of the 55 players invited to the Predators pre-season camp. Ford was born in Fort St. John, British Columbia on Christmas Eve, 1979, making him the second oldest player participating in camp, behind only Jerred Smithson. On the surface, it could appear that the 6'3", 216 pounder is in camp as some of "Crash Davis-type" (Bull Durham) player who's primary job it is to help a young "Nuke LaLoossh" AKA the many young defensemen, as a quasi-coach. POTG Thursday Headlines, News, and Links: More Cuts Coming Soon? The Nashville Predators return to a more normal day today where a bunch of the players and the coaches were not up for half the night after returning from a game. The two practice sessions move to the Bridgestone Arena today where they will be closed to the public. With games tomorrow night in Raleigh and Saturday night at home, the coaches will be taking serious looks at the players that actually will be playing in Nashville at some point this season. With Milwaukee's training camp opening Monday, there will be an exodus of players over the next few days so that Kirk Muller will have a representative bunch on hand when the AHL camp opens. Earlier this morning, we posted a feature story on defenseman Jack Hillen, who appears to have an inside track on one of the open defense slots in Nashville when camp breaks. Later today, we will have a story on Scott Ford, who is a guy that you will be pulling for to play an NHL game in the near future. If you aren't already at Sports Seasons, you missed this mornings 6 a.m. opening with the new Predators jerseys on sale. In early August, all of Preds Nation was focused on the Shea Weber arbitration hearing and what it all meant for the Predators and the captain's future in Smashville. It was almost an afterthought on August 8 when the Predators announced that they had signed Jack Hillen to a one year, two way contract that would pay him $650,000 at the NHL level and $105,000 should he end up in Milwaukee. Hillen is one of a growing number of players who decided to go the NCAA Hockey route to find his way to the pro ranks. After a year in the USHL at Tri-City, he went to Colorado College where he played four years and was named the WCHA Defensive player of the year as a senior in 2008. "I wouldn’t give up my four years there for anything," Hillen said with a smile. "I had great coaching and they really helped me get stronger. It’s not for everybody." Hillen is shorter than your prototypical NHL blueliner at 5'10", but packs a lot of muscle in his 190 pound frame. It's not by chance that he is stout for his stature. (In college) "You play fewer games but you practice and emphasise getting your body stronger and building your body in the weight room." With the first preseason game of the new season at hand on Saturday at the Bridgestone Arena, the Nashville Predators want you to be aware of several activities surrounding the game as well as the parking situation at LP Field. There will be a blood drive from 4-8 p.m. and plenty of plaza activities starting at 4:30 p.m. Donation for The Andie and Alex Belak Scholarship Fund will also be collected. Previously, it was announce that season ticket holders could pick up their "Predator Gold" jerseys in the customer service area. For those who park at LP Field, shuttles will be available for the standard $3 fare, but the pedestrian bridge across the river will be closed. The Nashville Predators gutted out a 2-0 victory over the Washington Capitals last night under poor ice conditions at the First Mariner Arena in the first ever Baltimore Hockey Classic. The team will return to the ice today from 11 a.m to 2:30 p.m at Centennial Sportsplex for practice but there will be only two sessions instead of three. Barry Trotz explained the change in schedule, " The three sessions (over the weekend) allowed us to go through repetitions. We knew that we didn’t want to have too much grind but we wanted good pace and lots of repetitions so we went to the smaller groups. Now we are going into bigger groups. Our fitness level is good." Earlier today, we began a mini-series looking at three older defensemen hoping to make the team. They were all undrafted and don't have the flash of being a star in junior or come with the expectations of a high draft pick. Nonetheless, they have compelling stories and could make the final roster when cuts are made. The first post of the trilogy is "Tyler Sloan: Looking for a Fresh Start in Smashville." In late July after all the prized unrestricted free agents had been picked over, Nashville Predators G.M. David Poile signed defenseman Tyler Sloan to a one year, two-way contract that only received any attention because there was nothing else to report in the hockey world. I was on vacation in Mammoth, California, sitting in a restaurant when I got the press release that Sloan had signed. I immediately did a little research on the web on my phone and was reasonably satisfied that Poile had done his due diligence and found another gem that could shine in the Predator system. A month earlier, Sloan had been bought out of the final year of a two year deal with the Washington Capitals, making the 30 year old veteran of 99 NHL games and hundreds of games in the AHL and ECHL a free agent looking for a new situation. Sloan explained, "I talked to them (Predators) in the summer and they said there was some opportunity in the back end with Frankie having some trouble still and needing to fill the five-six slot and potentially seven. They said that the opportunity was there and it’s up to you. You can play your way on or off." Pekka Rinne and Jeremy Smith combined for a 2-0 shutout at the First Mariner Arena on Tuesday night under poor ice conditions in the rink that has not seen professional hockey in many years. Chris Mueller scored the Preds a backdoor goal in the second period on a pass from Shea Weber. Colin Wilson scored the second goal on a broken play halfway through the third period. Niclas Berfors had two assists and Mueller assisted on Wilson's goal for a two point night. Ice conditions were the talk of the day and the game and appear to have been similar to the ice at last year's Winter Classic that was played outdoors in the rain. Again, information was limited with none or the usual statistical data available. The Preds returned home after the game and will back on the ice Wednesday morning at Centennial Sportsplex. Three players were sent back to their junior teams on Tuesday leaving the team with 52 players remaining in camp. Fans that are clamoring for the new "Predator Gold" jerseys do not have much longer to wait. This Thursday, the new home and road jerseys will be on sale at 6 a.m. at all middle Tennessee locations of Sports Seasons, the official jersey headquarters of the Nashville Predators. Fans who purchase the new sweaters will receive two tickets to the Preds' preseason game with the Washington Capitals on September 28 while supplies last. The Nashville Predators will square off against the Washington Capitals tonight at the sold out First Mariner Arena in what is being billed as the "Baltimore Hockey Classic." The game begins at 6 p.m. CDT and will be heard locally on 102.5 "The Game." The Predators "big three" of Pekka Rinne, Shea Weber and Ryan Suter will play for the first time this year as they are listed on the roster of 25 players traveling to the Charm City. It will be the Capitals' first preseason game and their line up features Alexander Ovechkin, Mike Green, Nicklas Backstrom, and Alexander Semin. Ex-Pred Tomas Vokoun is not making the trip. Here are links to the Predators' roster as well as Washington's travel squad. Update: Mueller replaces Geoffrion on trip - Here is the updated version of the Predators travel roster. Yesterday, when the Predators played their doubleheader in Florida, a picture of the opening face off indicated that there may have been only a few dozen folks in the Bank Atlantic Center. Dirk Hoag Tweeted "The puck is dropping on the 2011 NHL pre-season, but apparently in some form of witness protection program." Between the scarcity of folks in attendance and the information flow from the game, it did appear to be a secretive affair. 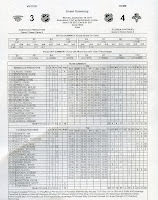 The official scoresheets that we received look like it had been smuggled from behind the "Iron Curtain" during the cold war era. Due to some type of glitch, it even had A. Radulov listed as #47 instead of Scott Ford. I really do not understand the Panthers did not provide information on par with the other two games last night. The trip, however, was a success as the Preds beat the Panthers 5-3 in game one and then lost 4-3 in a close one in the nightcap. Colin Wilson, Sergei Kostitsyn, and Blake Geoffrion had big games. This morning, another 20 players will head to Baltimore to play the Washington Capitals in a game that will be on Predators Radio at 6 p.m. CDT (102.5 The Game). It will be the preseason debut for Pekka Rinne, Shea Weber, Ryan Suter and Marty Erat. The Washington Examiner reports that Alex Ovechkin will play. Here is our story from this morning on Barry Trotz's return to Charm City. Caps coach Bruce Boudreau also has fond memories of playing in Baltimore. The Arena first opened in 1962 on the site of the “Old Congress Hall” where the Continental Congress met in 1776. The building was considered a cornerstone of the Inner Harbor redevelopment. More importantly to Predator fans, the Arena was the home to Preds head coach Barry Trotz’s first team as a head coach in the AHL during the 1992-93 season. “I thought it was old when I coached there so it’s going to be really old,” joked Trotz. The Florida Panthers put on their rally caps in the third period of the nightcap of Monday's doubleheader to earn a split in the first NHL doubleheader in many years. Ex-Predator Mike Santorelli and Tim Kennedy scored back to back goals on goalie Atte Engrin 53 seconds apart midway through the third period to pull even and then go ahead to give the Panthers a 4-3 lead which ended up being the final score in the second game of the rare hockey twin bill. The Preds jumped out to a two goal lead on goals by Teemu Laakso and Ryan Thang early in the opening period. Florida came back to tie the game 2-2 on goals by Eric Selleck and Jonathan Huberdeau. Blake Geoffrion put the Preds back in the lead with a goal late in the second period. He also assisted on Thang's goal for a two point effort and was named the game's second star. Matt Halischuk had two assists for the evening. Scott Clemmonson played the entire game for Florida, picking up the win and stopping 23 of 26 shots after a shakey start. Anders Lindback was in goal for the Preds for two periods and stopped 13 of 15 Panther shots. Engren came on and played the final period and stopped 8 of 10 shots. Nashville out shot the Panthers 26-25. Michael Latta tangled with Selleck in the second period in what was described as a punch filled bout. Click on the game summary on the right to enlarge. @rinkside provided this postegame video of a jubilant Jonathan Huberdeau who had two points in his first NHL level game. Thanks again to George Richards of On Frozen Pond for Cover it Live updates and to Harvey Fialkov and @rinkside for Twitter updates. 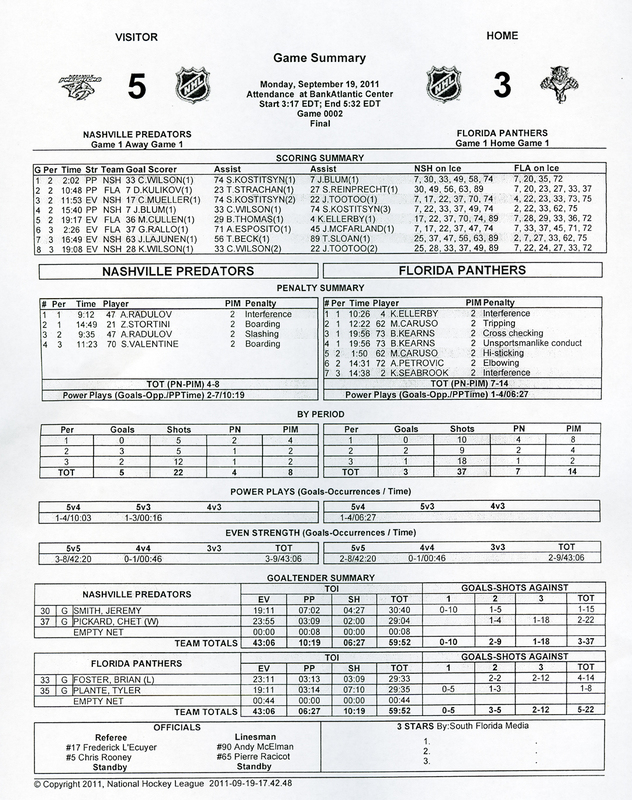 Jani Lajunen scored on a redirect from Taylor Beck as a Predators' power play had just ended with 3:11 left to break a 3-3 tie and sent the Preds on to victory in the first half of a double header with the Florida Panthers on Monday afternoon at the Bank Atlantic Center. Kyle Wilson scored another goal with 51.8 seconds left to put the icing on the cake. The Predators also had goals from Colin Wilson, Chris Mueller, and Jon Blum in route to the 5-3 win. Sergei Kostitisyn added three assists to the offensive outburst and Colin Wilson had two assists to also have a three-point game. Florida out shot the Predators 37-22. Jeremy Smith was in goal for the first half of the game, giving up one goal while Chet Pickard played the second half letting in a pair of goals. Florida's goals came from Dmitry Kulikov, Mark Cullen and Greg Rallo. The second half of the twin bill will have a 6:30 p.m. CDT puck drop as both teams will field all new rosters. From @rinkside: #Preds Tootoo on getting the preseason started: "We had a lot to think about over the summer. We're off to a good start here. We have to keep the momentum going from last year. I think guys are ready for the challenge this year." Thanks to George Richards of On Frozen Pond for Cover it Live updates and to Harvey Fialkov for Twitter updates. 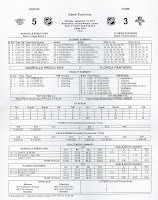 Click on the scoresheet to the right to enlarge. POTG Monday Headlines, News and Links: Let's Play Two! After a busy weekend at Centennial, the Nashville Predators pack up 40 players and all the coaching staff and head to Florida for a twin bill against the Florida Panthers. Here is more detail on the games from our pregame post earlier today. There is no radio coverage of today's twin bill but George Richards of the Miami Herald will chronicle the games with a live chat. Harvey Fialkov will also have updates at the Sun Sentinel. The Nashville Predators and the Florida Panthers will kick off the NHL Preseason schedule with a game today at 2 p.m. CDT at the Bank Atlantic Center. They will follow it up with the nightcap of the doubleheader at 6:30 in a very unusual split-squad doubleheader that is rarely seen in hockey these days. On Sunday, Preds Head Coach Barry Trotz discussed the "Ernie Banks, Let's play two" concept. "I’ve been a part of doubleheaders but have not coached one. This is more of a split-squad situation which you would see more in baseball." "When I was in Washington we did a lot of doubleheaders with the Philadelphia Flyers but we did those later in camp and it was more of a Milwaukee-Hershey type of game, which were the farm teams and then the two big teams played." It is rare for a hockey team to play a doubleheader this early in the preseason but the Nashville Predators and Florida Panthers will play an Ernie Banks ("It's a great day for a ball game, let's play two!") special beginning at 2:30 p.m. CDT on Monday and finishing with the nightcap at 6 p.m. The first game is the first NHL preseason match of the year. Here are the rosters for game one and game two. They are also archived under the Preseason Tab below the header above. The Predators will play again on Tuesday against Washington at the First Mariner Center in Baltimore with a more veteran squad that should feature the 'big three of Shea Weber, Ryan Suter, and Pekka Rinne. This weeks episode of RLD Hockey Talk featured Carolina and Versus broadcaster John Forslund and Chris Johnston from The Canadian Press. Both have joined us before and as always were entertaining and full of information. We get all the news on the Canes from John and touch on all the hot topics in the NHL with Chris. Today is the day when Predator fans will flock to Centennial Sportsplex to get a good look at the 55 players in the Predators preseason camp. Go here for the full preseason roster as well as grouping for the opening weekend of camp that can be printed by numbers or position. The full schedule is also available there too. The players will be on the ice both days this weekend from 9:45 a.m. until 2:20, broken into three groups that will each follow the same routine. Both sessions are open to the public and fans are encouraged to attend. Big Ben has his training camp guide that has some good advice for newcomers. Monday will mark the first preseason games with a rare doubleheader in Florida with games at 2 p.m. and 6:30 p.m. There will be no radio coverage. Tuesday's game against Washington from the old First Mariner Arena in Baltimore, at 6 p.m. will be broadcast from the Preds' new flagship station 102.5 The Game. After a road game at Carolina on Friday, the Preds will have their first home action on Saturday, September 24 against the Winnipeg Jets. The Nashville Predators released the group rosters for this weekend's sessions only. Go here for a downloadable/printable copy and it will also be stored under the camp links above, below the header. Over the past week, we have taken a look at several aspects of the rookies in the Nashville Predators Rookie Camp to try to give a feel for the variety of different competitions and individual goals. We explored how the 21 players were chosen. We looked at a pair of players that just want to make it to Milwaukee and discussed a couple of different routes players can take in their development. We also talked to a player looking for a fresh start in a new organization. Today, we are going to look at the agreement between the Canadian Hockey League and the NHL that has been in place for over thirty years. In its simplest form Junior players cannot play in the American Hockey league until the season where they have their 20th birthday before December 31. This is the day that the #SummerSucksDropThePuck crowd has been waiting for since Boston clinched the Cup in Vancouver last June. Every NHL team (except for Detroit) reports to camp today and will be on the ice on Saturday for the first official workouts. The first preseason games are on Monday with the Predators kicking it off with the first game of a double header on Monday at 2:30 p.m. The Predators will have their physicals and testing at 8 a.m. today at Centennial SportsPlex and be on the ice for the first practice on Saturday in three sessions that will run from 9:45 a.m. to 2:20. Today's testing is closed to the public but everyone can attend starting tomorrow. The same schedule will be followed Sunday. With the opening of the official training camp set for Friday morning, the Nashville Predators have updated the team roster and practice schedule. We will keep the latest versions on the page that you can reach at the link under our masthead above. They also released a breakdown of the 55 players that were invited to camp. It reveals that the team has the youngest average age in the past five years. Twenty-five players are from Canada, 17 are from the U.S., five are from Finland, four from Sweden, and one each from Belarus, Czech Republic, Germany & Switzerland. The roster includes nine sections from the third round of the NHL Entry Draft, Eight from the first, second, and seventh rounds, nine who went undrafted, and the rest from other rounds. The Nashville Predators and Fox Sports officially announced the television schedule for the 2011-12 season. A record setting 68 games will be televised and all will be in HD. For the first time, all 41 road games will appear on Fox or the NBC/Versus package, assuring season ticket holders the opportunity to see every game. Today we move into part four of our series from the Predators’ 2011 Rookie camp, we will take a look at the choices players have to make in their development process. First we will try to give a very superficial look at several options for players before they get to the professional ranks. This is a very high level view as each system has complicated rules that we cannot explore in this piece. Today is somewhat of a "dark day" as far as official activities at the Centennial Sportsplex for the Predators. The rookies had their last day of camp yesterday and the official camp starts tomorrow with player testing. The unofficial workouts continue but there is nothing else on the Preds' calendar. The Preds will have physicals and testing tomorrow and then the first on ice session for all players in camp is on Saturday when the goaltenders hit the ice at 9:45. The team will be broken into three groups and be on the ice until 1:40 p.m. Here is a link to the complete roster and schedule for the camp. We have the first three parts of our rookie camp series up on the site and will add part four later today. We hope that you are enjoying a different look at a few of the participants. Don Zavelo who has 30 years of experience with the National Labor Relations Board has been appointed as General Counsel to the NHLPA. He could become a household name among hockey fans as the NHLPA and NHL approach negotiations for a new Collective Bargaining Agreement for the current contract that expires next summer. A quick search indicates that Zavelo was involved in investigating an labor complaint against the NHLPA as led by Ted Saskin after the lockout in 2005. It was announced today that the Country Music Association's Awards Show will extend its five-year run at the Bridgestone Arena for three more years. Over 13 million guests have attended events at the arena since it was opened in 1996 and with the opening of the Music City Center it should become even busier. As we continue with Part Three of our series on various aspects of issues to be decided for players that attended the Nashville Predators' Rookie Camp, we recognize that not every battle is to make the NHL squad at this time. We will look at a pair of players that are eligible to move up the ladder from Canadian Major Junior Hockey to the AHL but due to a numbers crunch of top Pred prospects, they may have to return to the CHL. First a little ground work (apologies to those north of the border - we are a nontraditional market). Major Junior Hockey falls under the umbrella of the Canadian Hockey League (CHL) and encompasses three leagues - the Ontario Hockey League (OHL), the Quebec Major Junior League (QMJL), and Western Hockey League (WHL). Teams are primarily made up of players that are 17, 18, or 19 years old but three 20 year old (aka overage players) are allowed per team. Four 16 year olds are permitted and on rare exception (two to date, John Tavares in 2005 and Aaron Ekblad this year) 15 year olds can play. A side issue that we will address in a later post is that 19 year olds in the CHL cannot move to the AHL under the current league agreements. We will spotlight two Predators players that are on the bubble of going to the AHL as a pro player or returning to their Junior teams as overage players for a final season. POTG Hump Day Highlights, News and Links: Craig Smith for Mayor of Smashville? The Predators rookies completed the two game sweep of the games in Florida yesterday and Craig Smith added two more goals to give him six goals and an assist in two games. I bet he can't wait for the full camp on the weekend. Predfans probably want to elect him to mayor of Smashville. Here was our brief recap of the game along with the official scoresheet. Thanks again to George Richards of On Frozen Pond for the "Cover It Live" updates and Harvey Fialkov for Tweets throughout the game. Others with game stories included Smashville 24/7, Cellblock 303, Jay Levin, Predatorial, David Boclair, Fang Finger, and Josh Cooper has quotes from David Poile. Here is the raw footage highlights from yesterdays game from Preds.com. The Nashville Predators rookies won their second game in less than 20 hours with a solid 3-1 win over the Florida Panthers youngsters at Saveology Iceplex on Tuesday. Craig Smith continued to be a man among boys picking up two more goals, including one on a five on thee power play, to make it six markers in two games. 2011 draftee, Josh Shalla picked up the other goal for the Preds. Florida scored first on a goal by Jonathan Huerdeau early in the first but never countered the Predators three straight goals. The Panthers won the postgame skills competition as a consolation prize. Atte Engren started the game and gave up the Florida goal while Chet Pickard was perfect until the shootout. The game was marred by a fight between Eric Selleck and Michael Latta. Thanks to George Richards of On Frozen Pond for the Cover It Live updates and Harvey Fialkov for Tweets throughout the game. Three days into the 2011 NHL free agency period on July 3rd, Predator fans were anxiously awaiting a free agent signing, any signing. Marcel Goc, Steve Sullivan, and Joel Ward had already signed elsewhere. It was clear that Shane O’Brien was history. The Predators, with the smart money, were waiting for the prices to go down. The last thing anyone expected on a holiday weekend Sunday was that the Predators would send shock waves throughout the NHL community with a major trade. There was also fine print about draft picks but that just confuses the story here. Last night’s opening rookie contest between the Preds and the Lightning appeared to have been a one-sided affair as Nashville won 7-3. 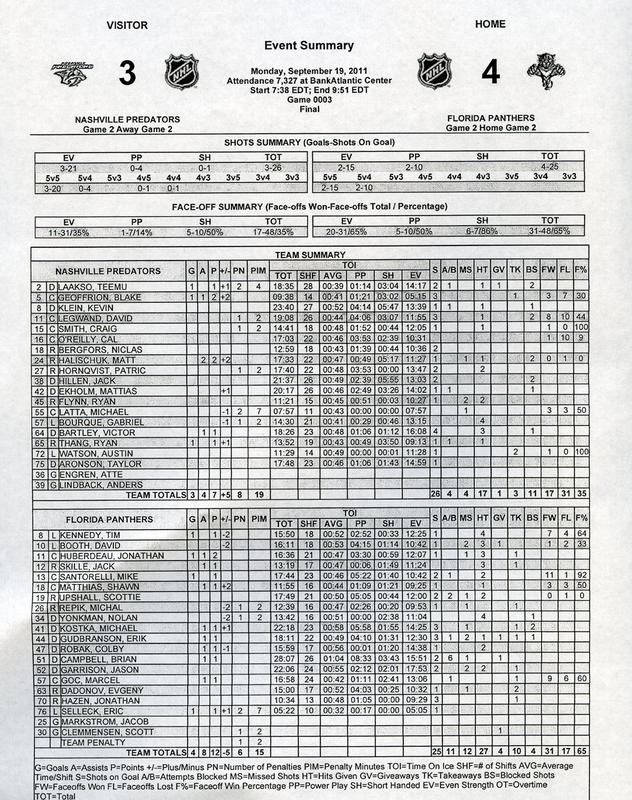 Here is our brief story and the scoresheet from the game. Here is a link to the raw footage highlights of the game posted at Preds.com. There was very little information flow from the game last night. Armed with only a scoresheet and a bunch of Tweets, all of the Predator writers did a great job of sounding like their was a horde of traveling press to Florida last night. Check out Smashville 24/7, Inside Smashville, Section 303, On The Forecheck, and Josh Cooper. Hats off to Chris Martel who got a transcribed interview from @rinkside with Craig Smith after his huge game. The Preds will take to the ice again this morning at 11 a.m. CDT against the hometown Florida Panthers as everyone will head back to the Internet for bits and pieces on information on the game. With very little information flowing out of the Saveology Iceplex, we can still safely say that Craig Smith was clearly the first star of the game, scoring four goals and adding an assist in a 7-3 romp with the Predators kids besting the Bolts youngsters. According to @NHLPredsinsider Taylor Beck also had a goal and three assists while Gabriel Bourque had four helpers. The Smith, Bourque, and Beck line appear to have been to much to handle for the Tampa squad. Austin Watson and Brent Andrews picked up the other two goals for the Preds. In net, Chet Pickard played the first half of the game, stopping 20 of 22 shots while Atte Engren stopped 20 of 21in relief. The Preds will return to the ice on Tuesday morning at 11 a.m. CDT against the Florida squad that beat Tampa 4-2 on Sunday. The Nashville Predators set records for ticket sales over the weekend as over 800 folks lined up at the Bridgestone Arena for opening day sales off single tickets for the first hald of the season. What was Barry Trotz's Defining Moment of the Predators 2010-11 Season? I was going through old audio clips last week and found a gold mine in a quote that I never used. At the post season wrap-up in May, I asked Barry Trotz if there was a "defining moment" in the season and he gave me a story in itself. "I don't know if there was a 'defining moment' but there was 'a moment' when I knew we were going to make the playoffs and that was in Buffalo when Blake had the really good game. We had played the night before and we didn't have a lot of juice left and we had an afternoon game against a non-conference opponent that was playing really well at the time." "We found a way to win. We found it late in overtime. To me, that was a defining moment that we were going to make the playoffs." Trotz continued, "To me a defining moment, just in our evolution was game one (of the season against the Ducks). We didn't flinch when Pekka Rinne went down and we made no excuses and then went 5-0-3 to start the season. (Laughs) Then we lost five in a row and came back to reality." "This team just got stronger and stronger and never flinched. As a coach, it was good to see. When some guys go out, others go 'I don't know how we are going to win now' but that was never the case, or even uttered by the team or the coaching staff." "It was just, 'This guys's got to fill in and we'll find a way.' That was the DNA of this team." That is the epitome of textbook "Predator Hockey" and should give encouragement to those who are doubting that the Preds have the horses to make a deep run this season. They always "Find a way." When the Nashville Predators released the list of 21 players that were invited to Rookie Camp, there were a few prospects that were not on there that you would have thought to have been included. Then again, the Preds are blessed with high quality young players, so all could not attend. This marks our first in a series of five articles taking a look at a few of the rookies and how and why they are here. We will also look at the different roads taken and where some will be headed for the season. After spending the weekend at Centennial Sportsplex watching the rookies work out and go through drills in preparation for games against Tampa at 5 p.m. today and Florida at 11 a.m tomorrow, it will be a letdown to get very little news on the kids for a couple of days. There will be no radio, local media, or Preds P.R.staff in Florida to cover the team so reports will be limited. Another thing that is interesting is that the team will be flying commercial so if you are the player stalker type, Metro airport is your place to be for the next two days. Later this morning, we will start a five part series that takes a look at who is in the rookie camp, why they are here, and what they hope to accomplish. The Florida Panthers' blog Litter Box Cats has the rosters and schedule for all three teams competing in the Florida rookie slate of games. They also have the story of Florida's 4-2 win over Tampa in yesterday's opener. Another neat thing that is happening during the tournament is that the Panthers will be collecting donations for the Wade Belak kids scholarship fund. The drive will continue next week when the full team returns for a doubleheader on Monday.too. This week we presented the first episode of Smashville On The Glass Radio which will be a weekly podcast that will be live on Fridays at noon and is a joint production of Ryan Porth of Smashville 24/7 and RLD Hockey and myself. In our first episode, we had Amanda Dipaolo of Inside Smashville and Jeremy Gover of Section 303 to have a round-table discussion of the Predators Rookie Camp and what to expect in the preseason and coming year. Today, there will be live, on ice, meaningful hockey in Smashville once again. The rookies hit the ice at Centennial Sportspex as the roster of 12 forwards, 7 defensemen, and two goalies will hit the ice trying to impress the Predators coaches enough to make it to the NHL at some point in their careers. There are a few players like Ryan Ellis, Craig Smith, Taylor Beck, and Mattias Ekholm who probably will see some time in Nashville this season. A couple of others like Taylor Aronson and Josh Shalla that want to go to Milwaukee rather than back to juniors as an over age player. The rest have their own stories and goals for the camp and season. Go here for complete practice schedules and rosters that you can print and take with you to the rink. Also, single game tickets are on sale now for the first half of the Preds season. Go here for details. There are donuts and big times at the Bridgestone for those stopping by. Make the jump for the rest of the weekend news and links. What happens when you take Ryan Porth of Smashville 24/7 and add in Buddy Oakes from PredsOnTheGlass? You get Smashville on the Glass. With that mind numbing thought in your head, we announce the debut of the Smashville On the Glass Radio show that will debut at noon CDT today on Blog Talk Radio and continue weekly in the Friday noon time slot. As we go forward, we will feature a look ahead at the Predators upcoming opponents with guests from around the NHL as well as local voices of others who cover the Predators. In our first episode, we will have two other members of the Bloggers Row Las Vegas Wolfpack, Amanda DiPaolo of Inside Smashville, and Jeremy Gover of Section 303. We will look back at Petey's Preds Party and look ahead to the Preds Rookie Camp that starts tomorrow and also what to expect in Preds Nation over the next few weeks. Ryan and I have teamed up on RLD Hockey Talk for over 75 episodes, bringing listeners some of the more interesting writers and personalities from around the hockey world. Previously, I had produced two years of PredsOnTheGlass Radio which was a mix of national and local guests. The new show should give listeners a more defined format with RLD Hockey Talk continuing on Tuesday's at noon and the Predator-centric show on Fridays. We hope that you will join us either live or on podcast as we try to bring you Predators talk the way you want it. If you have thoughts, suggestions, or someone you would like to hear as a guest, feel free to let us know. Last night's Petey's Preds Party was a huge success and was capped by a Carrie (Mrs. Mike Fisher) Underwood song. Here is our recap from last night with a surprisingly nice photo of the Wade Belak tribute jersey in the background. Ryan Porth and Amanda DiPaolo give their takes on the evening too. If you were not in attendance, "save up" for next year as Killer Bees says because it is an event not to miss. 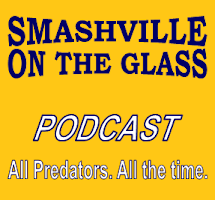 Later today at Noon CDT, you will be able to experience the debut of Smashville on the Glass on Blog Talk Radio with Ryan Porth and I as the hosts and special guests Amanda DiPaolo and Jeremy Gover. Predators single game tickets for the first half of the season go on sale Saturday at the Bridgestone arena at 9 a.m. and other outlets at 10. The Predators Rookies will also hit the ice Saturday morning at the Centennial Sportsplex and the public is welcome. The third annual Petey's Preds Party Benefit for Parkinson's Research and the Predator's Foundation was a overwhelming success by any measure. The event was moved from The Factory in Franklin to the Bridgestone Arena where an over capacity crowd of 940 folk were in attendance. As the festivities started, there was a moment of silence for Wade Belak as well as the KHL Lokomotiv team that perished on Wednesday. Throughout the evening there was a Belak #3 jersey illuminated to the side of the stage as a fitting tribute for the beloved Predator. George Plaster was Master of Ceremonies and led a host of folks to the stage including Predator coach Barry Trotz, who he claimed "got screwed" in Las Vegas for not winning the Jack Adams Award. Comedian Jeff Allen entertained the audience and promised that Barak Obama would soon provide free cell phones and cars for all. The real heroes of the evening were the host Brent Peterson and his guest speakers, ex-NBA player Brian Grant and former MLB player Ben Petrick, who all have led the fight for Parkinson's research and awareness. Peterson honored the victims of the 9-11 terrorist attack that occurred ten years ago this Sunday and then said that his "personal 9-11" was nine years ago when he was diagnosed with Parkinson's. His commitment toward finding a cure for the disease that "took away my chance to be a head coach in the NHL and his career as a coach with the Predators" is unrelenting. Peterson vowed to fight "with his last breath and last step to work hard to find a cure" for Parkinson's. The evening was capped off by a surprise visit by country star Carrie Underwood who was introduced as "Mrs. Mike Fisher" in a turnabout is fair play moment after her husband has carried her moniker since their marriage last year. The two-day event will continue tomorrow with another sold out event at the Legend's Golf Course when 60 teams will hit the links to compete for prizes and enjoy the fellowship with Predator players and coaches. POTG Thursday Headlines, News and Links: We've Had Enough Already! If 2011 was the summer of tragedy in hockey circles, then yesterday's airplane disaster in Russia was the world's largest exclamation point. Fans and members of the hockey community have had all they can take. The only hope is that the hockey gods will ease up and let the players get back on the ice with no more pain and sorrow. One by one as the day went on, almost very NHL team released a statement on the fallen hockey players. I do not think a single team was untouched by an ex-player, coach or friend of the team. It brought clear awareness to the dangers folks who travel for work face every day that hey go to their "office." So many folks were touched by the sad times that it is a reminder for everyone to keep those you love close at hand and be happy for every day that you have together. Enjoy your friends and folks you see every day and try being a little nicer to strangers you meed. You just never know when a day may be your last one. The Nashville Predators released the following statement today on the Lokomotiv Yaroslavl plane crash. Three former Predators were among the victims. “The Nashville Predators’ organization shares the pain and suffering being felt throughout the hockey world today following the tragic plane crash in Russia involving the team Lokomotiv Yaraslavl. Included on the team were two former Predators’ players – Karlis Skrastins and Josef Vasicek – along with Robert Dietrich, a 2007 draft choice who played two seasons in Milwaukee and remained on the club’s reserve list. Gary Bettman on behalf of the NHL and Donald Fehr of the NHLPA, both issued statements of condolences on the Russian plane disaster. "Though it occurred thousands of miles away from our home arenas, this tragedy represents a catastrophic loss to the hockey world -- including the NHL family, which lost so many fathers, sons, teammates and friends who at one time excelled in our League. Our deepest condolences go to the families and loved ones of all who perished." Toronto (September 7, 2011) – National Hockey League Players’ Association Executive Director Don Fehr issued the following statement today regarding the tragic plane crash in Russia. In a summer of tragedy in the hockey world, the news just doesn't seem to get any better with the announcement that a Yakovlev Yak-42 passenger plane carrying the Lokomotiv team of the KHL crashed near the city of Yaroslavl in Central Russia. We offer our condolences to families, friends, and acquaintances of the victims of the accident. Details of the situation remain sketchy but will come out in time. RLD Hockey Talk that was scheduled for noon today has been canceled out of respect all involved. One great bonus of a Monday holiday is that "Hump Day" comes early in the week which is always a good thing. Yesterday's release of the Predators camp schedule and activities along with most of the team hitting the ice for informal workouts leaves an air of anticipation that hockey season is finally here for the die-hards who will be at Centennial Sportsplex on Saturday for the start of rookie camp. We are also looking forward to attending Petey's Party tomorrow night at the Bridgestone Arena and seeing a bunch of folks that we haven't seen all Summer. A few tickets still remain. The Nashville Predators announced the official opening of the 2011 training camp for September 16 with the first on ice session the next day on Saturday, September 17. Here is a link to the full training camp roster in printable form as well as a printable preseason game schedule. The Nashville Predators announced that single game regular season tickets for the first half of the season will go on sale this Saturday, September 10, at 9 a.m. at the Bridgestone Arena. An hour later, ticket will be available at Ticketmaster or by phone. Tickets start at just $10 and service fees can be avoided with the box office purchase. With variable pricing in place, the earlier you buy, the better the price you will receive on single game tickets. Season ticket holders have been notified of their pre-sale that will run through Friday. With all the rookies slated to be here this week for their camp, hopefully this will be the week that the hockey faithful in Smashville can transition from the most turbulent off-season in franchise history to the actual preseason mindset, and start to look forward to the coming season. Most of the veteran players were in town for Wade Belak's funeral on Sunday but they do not officially return until the end of next week. Informal sessions will be ongoing at Centennial Sportsplex starting today for those who are already in town. The first official on ice session for the rookies will be on Saturday beginning at 10 a.m.with the goalies out first and then a full practice from 10:30 -1200. The same schedule will apply on Sunday. Both sessions will be open to the public. I would like to wish everyone a Happy Labor Day and hope that you are able to spend a few minutes relaxing with friends and family before hitting the grind again on Tuesday. We are in the midst of the remains of tropical storm Lee that is just what the doctor ordered for a very dry Middle Tennessee. Hockey fans everywhere continue to mourn the deaths of Wade Belak, Rick Rypien, and Derek Boogaard. The facts are not really know of the circumstances surrounding each tragedy. The reality is that as a group, and individually, they each suffered in their own way. Life is tough for everyone. I have heard life negatively described as a long series of troubling events that are occasionally interrupted by moments of happiness. That is a bleak outlook, but for many folks, it's not far from reality. The summer of tragedy in the NHL has brought to the surface a discussion of mental illness and depression that most folks would rather sweep under the rug and pretend that it doesn't exist. That is a problem. I hope everyone is having a great holiday weekend and will forgive me for being a day late on the holiday weekend post since we were mired in the depths of our major yard sale yesterday. I am happy to report that the clearing out of a ton of stuff was successful. The Wade Belak Memorial Charity Drive is building momentum and is approaching the halfway point of the goal. Join in, everyone is doing it. It only costs $3. We continue to offer up prayers for Wade Belak's family that will be at his private funeral in Nashville later today. Both guests had plenty of news and opinions that you will not find elsewhere. It is definitely an episode that you do not want to miss. We would like to remind everyone of Patten Fugua's fundraising efforts to honor Wade Belak. It is a great idea where everyone can participate for less than the cost of a cup of coffee. I hope everyone has a great holiday weekend and gets to relax a bit with friends and family. Unfortunately, we are having a yard sale today and tomorrow to try to clear out a ton of stuff form the house that the wife is transforming. Feel free to come by and haul something off (The best time is at night when we are asleep. If it is something big, the wife may wake up and help you steal it. She wants it gone!). Private services will be held Sunday, Sept. 4 at 2 p.m. at Woodmont Christian Church (3601 Hillsboro Pike, Nashville, TN 37215). In lieu of flowers the family will accept donations to The Andie and Alex Belak Scholarship Fund. Checks may be made payable to Woodmont Christian Church/Belak (3601 Hillsboro Pike, Nashville, TN 37215).